Off-the-shelf (OTS) software can be quite capable. For many companies, OTS software is sufficient to accomplish much of what they need to do as long as they are adaptable enough to use it. Large or growing companies, however, often make use of proprietary workflows and processes – impeding the ability to adapt to an off-the-shelf software solution. This is especially relevant to the life sciences industry, where regulatory standards, GLPs & GMPs and other compliance requirements mandate very specific, tightly-defined and controlled workflows. Custom: Develop a custom software solution, engineered specifically to the way the Company does business. When evaluating your company’s various software needs, there are advantages of each solution to consider. Standard, un-customized, off-the-shelf (OTS) software is comparatively limiting and rigid in how it can be used. When using an OTS solution, a company or organization’s work processes must be adapted to the software – and not vice versa. For companies with flexibility, this can be advantageous, often gaining insights into best practices by applying their solution’s workflow to the organization. But those with rigid processes, or workflows which must meet specific compliance guidelines, should consider exploring alternative solutions. Fully owned, custom-built software is the best choice for automating a company’s existing propriety processes. Having a custom system is a great way to institutionalize the valuable intellectual property of the company which may currently only exist in the manual actions of the workforce. When developing a custom system, only the precise options needed are included in order to avoid the cost of unnecessary features. Custom-developed solutions that work exactly as an organization requires can deliver significant ROI and productivity gains. Off-the-shelf software has improved by leaps and bounds over the last decade or so and – depending on the application – a number of attractive options have emerged for all businesses. But the route from custom to off-the-shelf can be fraught with misperceptions. A non-profit had been using custom software for 10 years when their developer suddenly abandoned them, taking the code with him. 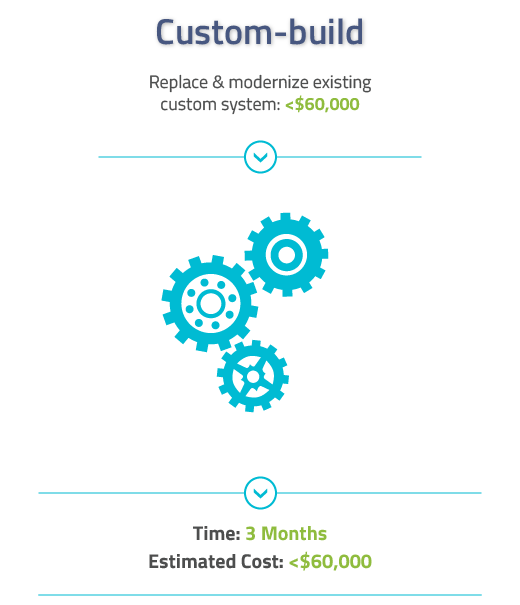 In the 10 years since the custom solution was started, new OTS options had become available. The organization believed that one particular open-source solution would give them 90% of what they needed to operate smoothly. They came to Digital Mettle asking for add-ons to fill in the blanks and give them what they believed was the remaining 10% to create their ideal solution. The off-the-shelf solution also came with many features they didn’t need, but they thought they might use…in the future. These kinds of ‘extra’ features rarely come with a custom solution, since clients rarely want to pay for add-ons they don’t know they need. They chose to move ahead despite warnings and recommendations. Here’s what happened next. This is how the situation evolved, stacked against what we had recommended. Off-the-shelf software has its own ideas of how things should be done. The situation evolved into a worst-case scenario, and they ended fighting against the off-the-shelf solution to change how it functioned. The final cost, nearly $120,000, was double what it would have cost to build a custom solution directly – not counting the loss in time incurred by the lengthy 16-month duration of the project. 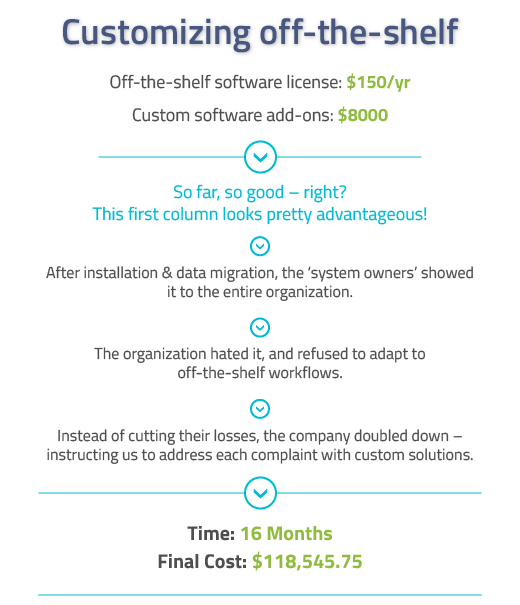 An organization had an off-the-shelf (OTS) system, with annual licenses amounting to thousands of dollars per year. The system generally worked to run their business. The organization was using it well, and staff was familiar with its operation. However, gaps remained – including reporting and other needed add-on tools. Creating a custom replacement for them would cost hundreds of thousands of dollars (far beyond their budget). It likely would not include many of the bonus features they wanted. Custom or Off-the-Shelf? Know Yourself and Your Organization. These two cases highlight the complexities involved in business software development and optimization. The important lesson to be learned from these two projects is that the best solution is often found in the project details. Cost-driven decision-making is fine, but it demands a clear understanding of project scope and objectives. An inability to modify team behavior (e.g., adapt to different workflows) can have a tremendous – and as demonstrated in the first case, above – disastrous impact on the success of a software development project.